This month’s Friends of Kickstart is bittersweet! We’re putting the spotlight on Alison Ross, a longtime team member who’s leaving the nest at the end of the month. Alison started with Kickstart in 2010 in our PA/Front Desk position, and over the past eight and a half years has held pretty much every production position we have from Coordinator to Associate Producer. We’ve also been lucky to work creatively with Alison over the years on a variety of projects, and look forward to continuing to collaborate with them in the future. Between packing up their many stuffed animals and desk accoutrements, and preparing for life as a Freelance Writer, we asked Alison to answer our Friends of Kickstart questionnaire. If you want to check out Alison’s work, you can head over to their website for details on their novel and various short stories they’ve written recently for both print and online publishers, as well as a look some of their favourite KS projects over the years. I’ve always been a big fan of green/purple combo which I used to think was called puce. I later learned that puce actually refers to the color of blood left on bedsheets after a flea has been crushed, which, blurgh. Can you think of a particular piece of media that inspired you to become an writer? The animated show Fillmore - the idea that you could infuse an adult genre into a kids show was really exciting to me, especially as a fan of genre fiction. 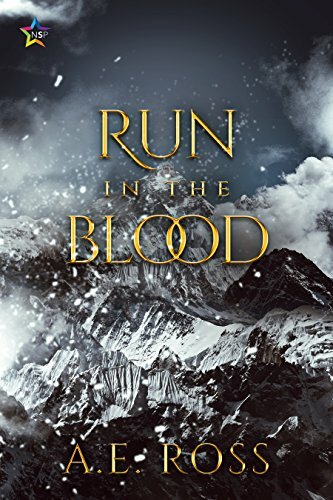 Alison’s first novel, Run In The Blood, is a fantasy tale published by Ninestar Press. I think the high point so far has to be getting to write an animated movie and then also producing that movie. It was so exciting to see everything come together from start to finish and to really understand the impact that a script has on the rest of the production. I would love to have better discipline. I’ve always struggled with focus and attention, and I would love to just be able to sit down and write without getting up five times for tea and snacks and then falling into a wiki research hole until I remember what I’m meant to be doing. It starts with a sleep in - late enough to feel rested but not so late that I feel guilty. Then a little walk to grab a coffee and some breakfast pastries before settling in to write. Once I’m tapped out on creative energy, it’s time for video games, junk food and cat snuggles. During university I worked part time at a yarn store in Victoria, BC. I am an avid knitter myself and there was something so wonderful about working in a place full of yet-to-be-realized creative energy. Every day I would come up with some new project I could make -- and the discount on supplies didn’t hurt either. One of the projects Alison wrote for Kickstart was Under Wraps, a CG Halloween special which aired on Family Channel and Cartoon Network. Pepper Ann, Cedric Sneer and Gene Belcher. I’ve been listening to the actual play RPG podcast Friends At The Table, and they way that they collaboratively tell stories in real time is something that I love so much. I’ve always been a huge Dungeons and Dragons fan (and long-time Dungeon Master) but I’m always amazed with the way that FaTT has managed to package pen-and-paper RPG play with a complex narrative and engaging characters in a variety of different worlds. Honestly, I create a bespoke playlist for every creative project I work on, from a sprawling fantasy world to a direct-to-DVD Christmas movie. It helps keep me in the world and keep me focused. When I’m working in production mode it’s a lot of folk punk or pop that lets me sync with my spreadsheets: Jeff Rosenstock, Antarctigo Vespucci, Beach Bunny, and that perennial Canadian classic: Carly Rae Jepsen. We’ve been lucky enough to work with this Friend of Kickstart both inside and outside the record booth over the past few years. A distinguished actress both in voice-over and on camera, as well as a wonderful voice director, we are big Nicole Oliver fans here at Kickstart. Here are Nicole’s answers to our ten vital questions about life, acting and animation. For our first ever “Friends of Kickstart” feature, we wanted to put a spotlight on someone who always makes us sound amazing: sound designer & composer Mark Dolmont!